In the 2014 case of “Grace Grande v. Patricio Antonio” G.R. No. 206248, the Supreme Court declared void Rule 7 (Requirements for the Child to Use the Surname of the Father) and Rule 8 (Effects of Recognition) of the Implementing Rules and Regulations of RA 9255. Thus, the Philippine Statistics Authority issued the Revised IRR, which became effective on April 9, 2016. Read below the revised guidelines on how illegitimate children can use their biological father’s surname and my critique of the guidelines. 4. The child is still illegitimate even if the biological father’s surname is used under RA 9255. The mother still has exclusive parental authority over the child. 5. RA 9255 uses the word “may” while its IRR uses “shall.” Because of the mandatory nature of the IRR, it has become a tool of oppression against women. If the biological father simply signs the birth certificate or issues a public or private document acknowledging the child, the child automatically will carry his surname, even without the mother’s knowledge or consent. The Supreme Court unanimously declared void Rule 7 and Rule 8 of the Implementing Rules and Regulations of RA 9255 (“Grace Grande v. Patricio Antonio” G.R. No. 206248, February 18, 2014). RA 9255’s clear use of the word “may” in amending Art. 176 of the Family Code shows that illegitimate children’s use of the father’s name is discretionary. Even if the biological father acknowledges his illegitimate children, he cannot force them to use his surname. Article 176. Illegitimate children shall use the surname and shall be under the parental authority of their mother, and shall be entitled to support in conformity with this Code. But illegitimate children may use the surname of their father if their filiation has been expressly recognized by the father through the record of birth appearing in the civil register, or when an admission in a public document or private handwritten instrument is made by the father. Provided, the father has the right to institute an action before the regular courts to prove non-filiation during his lifetime. The legitime of each illegitimate child shall consist of one-half of the legitime of a legitimate child. The Office of the Civil Registrar General then issued in May 2004 the “Rules and Regulations Governing the Implementation of R.A. 9255” (or IRR for brevity). Our laws on the use of surnames state that legitimate and legitimated children shall principally use the surname of the father. The Family Code gives legitimate children the right to bear the surnames of the father and the mother, while illegitimate children shall use the surname of their mother, unless their father recognizes their filiation, in which case they may bear the father’s surname. The Court reiterated this ruling in “Republic of the Philippines vs. Trinidad R.A. Capote,” G.R. No. 157043, February 2, 2007, 514 SCRA 76. 2. Contrary to what a lot of people believe, RA 9255 does not grant legitimacy to the child. Even if the biological father allows the use of his surname, the child still remains illegitimate. Parental authority still belongs to the mother, which means custody belongs to her. That is why Article 176 still distinguishes between the legitimes (share in the inheritance) of legitimate and illegitimate children. Can RA 9255 be undone? 3. Some women informed me that they availed of RA 9255. Later on, these women had a falling out with the biological fathers and were no longer living together or communicating. The question I have been asked is, “Can RA 9255 be undone?” That is, can the child’s birth certificate be changed so that the surname will now be that of the mother? My answer has been that the possible legal remedy is Rule 108 Cancellation or Correction of Entries in the Civil Registry (a petition under Rule 103 for change of name may also be possible). But the problem is that RA 9255 is for the benefit of children so that they will not bear the stigma of illegitimacy. The courts may therefore not be inclined to grant the correction or cancellation (although as of now, I have not have read or known of a court decision on this matter). 4. Even before RA 9255 took effect, biological fathers have signed the back of the birth certificate in order to admit their paternity. In keeping with Article 175 (in relation to Article 172), fathers, by signing the birth certificate, need no longer execute a separate document in order to acknowledge their illegitimate children. Meaning, the issue of support and inheritance was not tied to the issue of whether the child uses the father’s surname or not. Lawyers and judges always differentiate between the words “may” (which denotes direction or permission) and the word “shall” (which denotes an obligatory or mandatory nature). The illegitimate child shall use the surname of the father if a public document is executed by the father, either at the back of the Certificate of Live Birth or in a separate document. Rule 8.2.1 If admission of paternity was made either at the back of the Certificate of Live Birth or in a separate public document or in a private handwritten document, the public document or AUSF shall be recorded in the Register of Legal Instruments. Proper annotation shall be made in the Certificate of Live Birth and the Register of Births as follows: "The surname of the child is hereby changed from (original surname) to (new surname) pursuant to RA 9255." IRR of RA 9255 as a tool of oppression against women? Where is the mother’s freedom of choice in what surname her illegitimate child will use? What if the woman decides to raise the child by her own without any help or support from the man? Moreover, Article 176 of the Family Code provides that an illegitimate child is under the sole parental authority of the mother. The decision of whether or not to use the father’s surname in the birth certificate rightfully belongs to the mother in keeping with her exclusive parental authority over the child. Unknowingly or unintentionally, the people who crafted the IRR of RA 9255 made it as a tool of oppression against women. If the biological father simply signs the birth certificate or issues a public or private document acknowledging the child, the child automatically will carry his surname, even without the mother’s knowledge or consent. For example, I know of a pregnant 18-year old girl. The girl’s family wisely refused to allow the the girl to marry the man (22 years old, jobless, and irresponsible). The family is taking care of the girl and planning to raise the baby by themselves without any help from the man. But based on the IRR of RA 9255, the man can create a lot of problems if he is able to sign the birth certificate OR if he simply issues a document acknowledging the child. Based on the mandatory nature of the IRR, the child will automatically carry his surname, despite whatever objections the girl and her family might have. Another case: The illegitimate child was born in the 1990’s with the birth certificate carrying the mother’s maiden surname. The father signed the back of the birth certificate, but from the child’s birth, he never gave any financial support. The mother was forced to work overseas to support the child by herself. Recently, upon coming back to the Philippines, she discovered that her child was under the custody of the biological father and was now using his surname. Why? The man and his family (who have now become interested in the child) submitted the requirements to the Local Civil Registrar. Under the mandatory nature of the IRR, the child is now using his surname, without the knowledge or permission of the mother! Based on the letter and spirit of RA 9255, the woman should give her consent as to whether she wants or not her child to carry the man’s surname. The IRR is wrong because of its mandatory nature. Meaning, okay, let the man sign the birth certificate to acknowledge the child. That is for the benefit of the child with regards the issue of support and inheritance. But as to what surname that child will carry, the mother should be given the freedom to choose, whether to use the man’s surname or use her maiden surname. Senators Loren Legarda and Ramon Revilla (the father, not the current senator) are some of the principal sponsors of RA 9255. The spirit and intent of RA 9255 are certainly commendable. But the IRR as it stands now makes RA 9255 a tool for oppressing women. Perhaps, our current senators should review the IRR and make the necessary and urgent clarification or revisions. “This bill aims to emphasize the primordial importance of the role of mothers when it comes to the surname of their illegitimate children. The proposed amendment, in recognition of the fact that mothers have the sole parental authority over their illegitimate children, mandates that mothers should give express prior consent to the use of the father’s surname, There is a danger that a father might use this right as leverage over the mother, either to avoid obligations or to impose unreasonable demands, and as a result undermine the parental authority of a mother over her illegitimate child. The problem is, SB 718 has been “sleeping” in the Senate for the last three years. Moreover, it seems to me that the use of the word “may” in RA 9255 already indicates that the use of the father’s surname is not mandatory as the IRR has made it to be. Also, SB 718 does not address the issue of whether RA 9255 can be undone for those children whose surnames have already been changed without the consent of their mothers. Without waiting for Sen. Legarda’s clarification, for Sen. Bong Revilla’s bill to become law, or for the NSO to act on this matter, women affected by this situation should go to court to seek relief. One option is to file a petition for declaratory relief under Rule 63 of the Rules of Court (please surf to the Chan Robles website for the Rules of Court). In layman’s terms, a petition for declaratory relief is asking the court to issue its legal opinion on whether the IRR exceeded the letter and intent of RA 9255. This petition can only be filed by a party who has not yet been adversely affected by the IRR. In the case of mothers or children who have already been adversely affected by the IRR (that is, the child now carries the surname of the biological father despite the lack of knowledge or consent of the mother), a petition for declaratory relief is not the proper remedy. A petition for certiorari under Rule 65 of the Rules of Court may be the more appropriate remedy. 8.5 Upon reaching the age of majority, an illegitimate child acknowledged by the father shall use the surname of his father provided that he executes an AUSF without need of any attestation. As you can see above, Rule 1 of the Revised IRR states that it applies to all illegitimate children born during the effectivity of R.A. No. 9255. Issue: RA 9255 became effective on March 8, 2004. What about those illegitimate children who were born before this date? Why are they excluded from the right that’s provided by RA 9255? Likewise, [Engr. Antonet B. Catubuan, Chief Statistical Specialist] clarified that the revised IRR is only apply [sic] to all illegitimate children born on or after March 19, 2004, the effectivity of RA 9255, whether registered or not under the surname of the mother. Catubuan added that illegitimate children born on August 3, 1988 to March 18, 2004 cannot use the surname of the father under RA 9255 but may still be acknowledged by the father through an Affidavit of Admission of Paternity (AAP) or Private Handwritten Instrument (PHI). “A petition in court may be filed in order that the child can use the surname of the father if the child’s birth falls on the said dates,” Catubuan explained. If the PSA Aklan official was quoted correctly, then I contend that the Revised IRR is legally flawed and may, like the old IRR, be challenged in court. 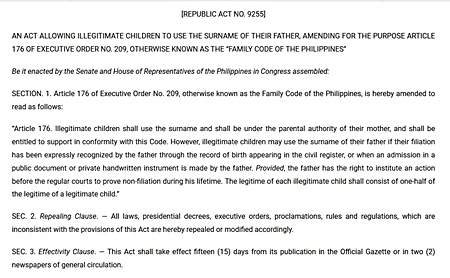 As you can see from the screenshot below, there’s nothing in RA 9255 that says that it’s only applicable to illegitimate children who were born between August 3, 1988 (date of effectivity of the Family Code of the Philippines) and the date the law becomes effective. The Revised IRR thus goes beyond the law that it’s supposed to implement and discriminates against illegitimate children who were born between August 3, 1988 and March 8, 2004. It seems that the PSA has gone from one extreme to another. 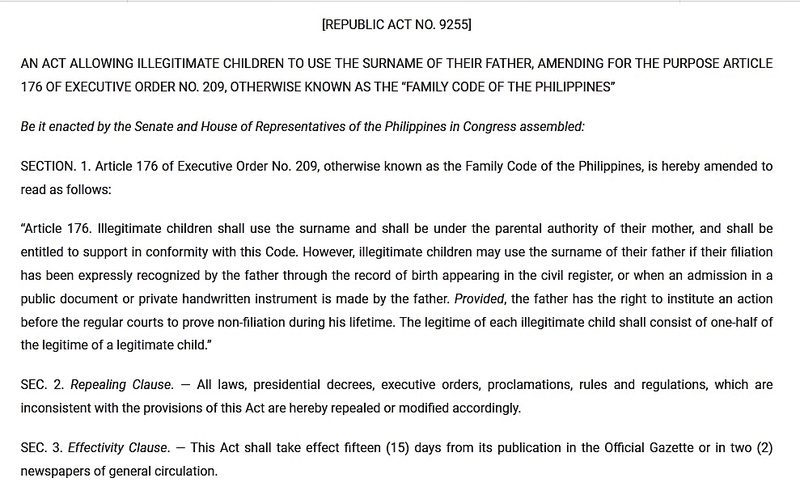 Under the old IRR (see Rule 8.2.1 as cited above), the PSA made the use of the father’s surname mandatory for all illegitimate children, even for those who were born before RA 9255 became effective. Now, with the Revised IRR, the PSA has excluded from the law’s coverage those illegitimate children who were born between August 3, 1988 and March 8, 2004. If you are an illegitimate child who was born between August 3, 1988 and March 8, 2004, and you want to use your biological father’s surname under RA 9255, I suggest that you file a petition for declaratory relief with the Regional Trial Court in your city against the PSA and its Revised IRR. Is there an option for the child to reclaim his mother's surname when the child turns 18? Can you please explain "petition for declaratory relief"? RA 9255 does not provide such an option. Rule 108 may be a way for a child to reclaim the mother’s surname although there will be a lot of complications in practical terms like school records. Declaratory relief is covered by Rule 63 of the Rules of Court (please surf to the Chan Robles website for the Rules of Court). In layman’s terms, a petition for declaratory relief is asking the court to issue its legal opinion on whether (in the context of the discussion in this post) the IRR exceeded the letter and intent of RA 9255. This petition can only be filed by a party who has not yet been affected by the IRR. In the case of mothers or children who have already been adversely affected by the IRR (that is, the child now carries the surname of the biological father despite the objection of the mother), a petition for declaratory relief is not the proper remedy. A petition for certiorari under Rule 65 may be the more appropriate remedy. I am separated with my husband for 6 years now and we have a daughter who was 12 yo. I am not using my husband's surname when we got married. Presently, I have a partner who was responsible and a Filipino too.He was married also in the Philippines and separated for a year.I am pregnant right now. I want to use my partner's surname for our new baby.I don't know what to do? Since we are both here in New Zealand. hi! i have a cousin who has given birth recently. her problem is that, the biological father (as she claims to be the biological father) does not recognize the child. what would be the effect/s of that? his name has been written in the live birth of the child but he did not sign the affidavit of acknowledgement. H1B holder, naka-stamped na but my kid ndi pa but planning to do it soon. sa birth cert though meron acknowledgement un father. and sa current law ngaun sa phils, pde na gamitin ng son/daughter un surname ng father as long as in-acknowldege. sa school since he is using his father surname sa school nya ngaun. cya ang current passpport nya nakasunod sa surname ko... magkaron kaya ng conflict sa passport, immigration record versus sa school record nya? my kid wants to use his father surname and i want to give him want he wantspde po ba un pagdating sa docs sa US and sa passport etc..
1. The child is illegitimate. 2. Since the man refuses to acknowledge the child, then the surname of the child will be that of the woman with the entry for middle name left blank. 3. If your cousin has proof that the man is really the biological father of the child, then she can file a petition for compulsory recognition of the child. If it is established in court that indeed the man is the child’s father, then the woman can ask for financial support through a Protection Order under RA 9262. It also means that the child can inherit from the biological father. 4. If your cousin can prove that she and the man had a sexual or dating relationship (even if such sexual relationship did not result in pregnancy or childbirth), then she can file a civil or criminal case under RA 9262 against the man. Article 176 as amended by RA 9255 certainly allows your child to use his father’s surname. But as you already have a hint, having different surnames for your child’s records (passport, school records, etc) will cause confusion. Most probably, you will be issuing a lot of affidavits to prove that the person named in your son’s school records is one and the same person as that mentioned in passports, immigration records, etc. It is a potentially messy situation. Hi i am a 22 year old mother and i have a 2 year old daughter. She was born on April 7, 2006. i just want to know if i would have a problem with the IRR, since she has been visiting her father through the other grandparent's intuition even though the father has not signed the birth certificate and any public document. Would i be troubled with the IRR? As I discussed in this post, the intent of RA 9255 is commendable in that it seeks to avoid the social stigma that illegitimate children often experience. The problem as I discussed, however, is that the implementing guidelines went beyond the intention of the law. If your child’s grandparents find out about RA 9255 and its IRR, they might convince their son to execute and submit an AUSF (Affidavit To Use Surname of Father) to the Local Civil Registrar. When that happens, whether you like it or not, your child will carry the biological father’s surname. Perhaps you can bring this matter to the attention of Sen. Loren Legarda who was the principal sponsor of RA 9255. Please clarify. Are your kids illegitimate, meaning, their biological father is NOT the one against whom you filed the petition for annulment? I disagree with what the LCR lawyer told you. If for any reason, the biological father wants to take custody or exercise visitation rights, you will get into a legal mess if your place “unknown” in the entry for father. Besides, having "unknown" as the father of FOUR kids is a little bit difficult to believe. You said that you have an ongoing annulment case. In the petition for annulment, did you include the fact you had four children with the respondent (your husband)? Under the circumstances, the lawyer handling your petition for annulment should be the one to answer your question on what to do with the birth certificates. My wife is a victim of this RA 9255.We are married and her 13 y/o daughter is under her custody. The biological father upon trying to avail of the ra 9255 at the makati civil reg, was requested to get my wife's consent. since the biological father knows that my wife doesn't agree with family name changing, he falsified an affidavit stating that my wife said that "it is not neccesary anymore for her to write a letter of consent". Unfortunately, the civil registry bought his reasoning and granted him the ra 9255. Recently, he wanted to get the passport of the child from us and saying infront of the judge that he will change the name of the child using his surname... the court did not grant the request of bringing out the passport and stated that he cannot change the surname in the child's passport. Now, he went to the child's school and forcing them to change the surname of the child again. He just wouldn't stop. I am the best friend of the brother of Sen. Loren Legarda coincidentally, i would just like to know what i should tell her regarding this matter as not to forget all small details that the other parties might capitalize on again. thank you so much. It is not RA 9255 actually that is the problem. The law is very noble in its intentions. As I discussed however in this post, the NSO exceeded its jurisdiction when its implementing guidelines made RA 9255 MANDATORY for all illegitimate children rather than optional. The NSO guidelines completely disregards the mother’s freedom of choice. 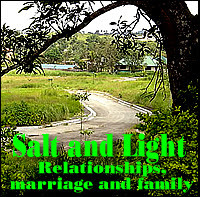 Please download my free PDF newsletter on this topic from my website www.familymatters.org.ph The particular newsletter is Issue no. 005 August 15, 2008 titled "What surname should illegitimate children use? Problems and issues with RA 9255 and its implementing guidelines"
You can show this PDF newsletter to Sen. Legarda. 1. It is only marriage that can make you a legitimate wife, not living together for a number of years. 2. Even if your children are illegitimate, you can ask for support for them and for yourself through a Protection Order under RA 9262. Please read my post titled “Financial support for abandoned woman and her children” (look for the link in the sidebar or use the blog search tool). 3. If pursue any action to have your partner terminated from his employment, he will not be able to support you and your kids. I just gave birth to a son 3 weeks ago. His father has been previously married but is currently observing "mutual separation" from wife and kid. We've been together for 2 years and now that we have a child, and with RA 9255, both of us would like to have our son take on his surname. Situation is - we plan on visiting our family and relatives in the US soon. However, I've been told that illegitimate children bearing the name of their fathers weren't granted tourist visas for some reason. Because of this, I'm thinking that it might be best to have our son carry my surname for the time being though I know that this would hurt his father's ego. I'd like to know what are the chances if a filation was to be done later on to annotate our child's birth certificate and have our son use his father's surname eventually. I've got a few more days to make that decision on what needs to be reflected on the birth certificate prior to filing - please help. As I discussed here, under RA 9255 and its implementing guidelines, if the man signed the birth certificate, then AUTOMATICALLY, the child’s surname will be that of the man. If not, the man can later on issue an AUSF (Affidavit to Use the Surname of the Father) which will then be submitted to the LCR or NSO. Please take note however that such a birth certificate with the man’s surname may be used as evidence for a charge of concubinage (specifically on cohabitation) against the man and you. I just want to ask if its ok for my child to use his father surname as he is recognized by his father.. we are not married, if my son will use his father's surname ako pa din po ba ang magkakaron ng full costudy sa anak ko, natatakot po ako na baka kunin nya sa akin ang anak ko meron na po kasi akong asawa ngaun and may baby n din though hindi din kami kasal ng present. can i still ask for financial support for my son? what steps should i make? this time po kasi the father of my son wants him to be registered w/ his surname,and he wants a full costudy of my son instead of giving financial support. my son is now 4yo and not registered yet . pls help me what to do? Even if your son will use his father’s surname, he will still be illegitimate. Under Article 176 of the Family Code, SOLE parental authority (which includes custody) belongs to you. The father can only have visitation rights. Please read my post on visitation rights over illegitimate children (look for the link in the sidebar). If you cannot agree on the schedule of visits, then the Family Court can settle this issue. The problem is, does your child’s father know about Article 176 of the FC? Does he know that even if the child uses his surname, parental authority still belongs to you? You can compel the father to give support to your son on the basis of a Protection Order under RA 9262. Please read my post “Support for abandoned woman and family” (look for the link in the sidebar). The father cannot “blackmail” (if I may use the word) you into giving him full custody instead of providing support. You can ask for free legal assistance from the PAO (Public Attorneys Office) or from the IBP (Integrated bar of the Philippines) chapter office in your place. The IBP chapter offices are usually located in the Hall of Justice of cities. hi, im married for almost 10 yrs now, our marriage is an ON/OFF thing.both of us had relationships outside marriage. am currently 7 mos pregnant with another man, my husband and i are not sleeping in one roof anymore,but we have 3 kids he supports, we are neighbors though. would just like to know if i can file the baby's name under mine even if i'm married. Since your marriage has not been annulled or declared null and void, then any child born is presumed to be legitimate (meaning the child is that of your legal husband and not of your present partner) with certain exceptions provided under Article 166 of the Family Code. But such grounds can only be invoked by your husband or his heirs. In this case, the Supreme Court declared a child to be a legitimate child of the legal husband despite declarations made by both biological parents that the child was illegitimate. You can read from the decision that the Court said that there was a possibility of sexual union between the husband and the wife (despite their separation) since they both lived in Quezon City. In your case, you and your husband are neighbors. im a father with 4 yrs old son. during his birth, i recognized the child but the birth certificate lacks the signature of the doctor. then later on i found out that the mother of my son, made another birth certificate through a midwife without me knowing and they are using that birth certificate now. Today, my son uses the lastname of her mother, and she demand of a child support. Im giving my support for the child since birth, but even I give my support the mother and her family are telling a lot of things to my son so that he will not come to me or para mapalayo ang loob sakin ng bata. I want my son to use my last name. What will I do? also, is there a chance for me to have the custody of my son when he reach the age of 7? Please coordinate with the Local Civil Registrar which issued the birth certificate. By filing an AUSF (Affidavit to Use the Surname of the Father), the child will carry your surname. Please take note however that the child is illegitimate. This means that you only have visitation rights; the mother has sole parental authority. The only way you can take custody of the child is for you to file a petition for termination of the mother’s parental authority. But this will be a very difficult legal battle for you. You must be able to prove that there are compelling reasons (immorality, drunkenness, etc) for the mother to be deprived of her parental authority. hi. im pregnant for 4 months now and is planning a lot of things for my baby. my partner is married to someone but they are no longer living together. they have a daughter from that marriage. im now wondering, should i/we use the father's surname when this baby is born? is it better to use my surname instead knowing their annulment is not really of a big discussion as of now. i just feel that since he is still married to someone, our baby might have problems with documents and all im really not sure. Advice needed. thanks so much. more power! If you use the father’s surname, that can be used as evidence against him by his legal wife in a case for psychological violence under RA 9262. Also, if you read the comments and my replies to the comments on the post on the Family Code primer on illegitimate children (look for the link in the sidebar, a lot of women have regretted using the father’s surname). When the man refuses or stops giving support, then the woman usually wants to change the child's surname to her maiden surname. 1. What steps do they have to do to adopt the 1st child (not the husband's biological child)? 2. What steps do they have to do to make their 2nd child (biological child) legitimate? With regards the 1st child (not the husband's biological child), adoption under RA 8552 is the proper procedure. Please read my post “Procedures in adoption under RA 8552” (look for the link in the sidebar. Art. 177. Only children conceived and born outside of wedlock of parents who, at the time of the conception of the former, were not disqualified by any impediment to marry each other may be legitimated. Art. 178. Legitimation shall take place by a subsequent valid marriage between parents. The annulment of a voidable marriage shall not affect the legitimation. If the requisites for legitimation are present or complied with, then your friend and her husband can submit the necessary documents to the Local Civil Registrar. Please surf to the NSO website www.census.gov.ph for the documents required for legitimation. Article 177 simply means that at the time the child was conceived, your friend and her husband were not suffering from any legal impediment like minority, a validly subsisting marriage to another person, etc. Hi! Good day. I was reading some comments here regarding the surnames of children born out of wedlock. I am one of that child. My father signed my birth certificate and acknowledge me as his child, i thank him for that. There is a part of my birth certificate that says place and date of birth of parents and my father put lets say Place of Marriage- Manila and the date for example is Feb. 2005. But there is no marriage that take place. My mother now is married to a foriegner, she was able to get a cenomar because no marriage takes place, she was even placed on Administrative review while the embassy verified and check it at the NSO. In her husbands petition we are included but my mother did not include us because she is afraid she will be denied, instead tell the consul on her interview that we will not go with her, so there is no further questions about us. Now she is already ready to file a petition for us because me and my brother is already 20 and 18. My mother is still a greencard holder. My problem is will this affect her petition with us. Just a recap after my mother gave birth to my brother (only 3 mos old) father left us to the custody of our mother until now no communication between us. Please help me. Is the lawyer needed in this case. How much is the cost if ever needed. The embassy or consulate could possibly question the discrepancies between your mother’s CENOMAR and the entries in your birth certificate indicating that she is married to a certain person (your biological father). Separation in time (despite the number of years) does not invalidate a marriage. Please consult immigration lawyers as to your situation. I'm 5 months pregnant and I'm planning to use my boyfriend's surname. 1. what are the benefits of having the father's surname? 2. just in case we don't end up together, can I still change his last name into my legal husband's surname? 3. Will it be more beneficial for the baby to have my last name? I told my friends about giving this baby his father's surname and they said it might cause me trouble in the near future. I want this baby to have his father's surname of course, but I wanted to be educated before I make that decision. Please read my post “Family Code of the Philippines: Primer on illegitimate children” (look for the link in the sidebar), the comments and my replies to the comments. A lot of women have regretted using the man’s surname in the child’s birth certificate especially when the man refused to provide financial support or totally abandoned them. Some women also had the opportunity to get married to other guys and problems arose since their child is using the biological father’s surname. If you plan to go abroad in the future, you will have problems bringing your child out of the country if the birth certificate bears the father’s surname. Hi, I am a mother of a 5 year old boy and a 2 year old girl. Their father had worked in Manila and lived with our son in his sister's house, while my daughter and I live in the province in my parents house. We both agreed to this setup because of the work place. And we just visit each other on vacation ang holidays. Their father died 2 years ago. Actually, he died before we got married. And my kids are using my surname since we're not married. When he died, I told his sister that I am goiong to get my son and bring him to our province so that the 3 of us will be together. This sister took care of my son since my husband is working. And she does not want to give back my son. She said that I can only get my son if he is old enough. Is that right? What should I do and what preparations should I make? She took care of my son just because he was with his father that time. I want to seek a recommendation on what I should do with the birth certificate of my son to avoid conflict in my approved application as immigrant in Canada. I am a single mother and the principal applicant, a provincial nominee of Manitoba nominated by my uncle living in Canada. I accompanied my son in my application and it was been approved and now for visa application that must be received by visa section office by month of August. My concern is the name of my son in his birth certificate follows my middle name and my surname. And the name of his father is not mentioned. It is type as UNKNOWN. By now, I have to make changes on it and need to be acknowledged by his father. We are not married. He just has to acknowledge my son on his birth certificate. The last option is also to be acknowledged by his father under RA 9255 and my son’s middle name and surname could be changed by letter. Also the typed UNKNOWN on the details of his father could be erased and replaced by his father’s name. The processing time in this option will take longer than the two options and I could be possibly late in the given time which is by August, you must received all our original documents for visa processing. I need your recommendations on this matter to avoid confusions. Hi! I was a single mother before i got legally married last Feb 2008. My daughter is now 6 yrs. old and bears no name of her biological father, nor has any acknowledgment whatsoever on her birth certificate. It actually shows N/A on the father's name. She's currently using my maiden last name with the middle name left blank on all her school papers. Furthermore, I don't have any communication with the biological father. My husband and I wants to have my daughter use his last name. Is it possible for my husband to acknowledge my daughter as his own? What can we do to legally have my daughter use my husband's last name? Please help me. The last option is also to be acknowledged by his father under RA 9255 and my son’s middle name and surname could be changed by letter. Also the typed UNKNOWN on the details of his father could be erased and replaced by his father’s name. What do you mean by “could be changed by letter” and “could be erased and replaced”? The LCR or the NSO will not make changes in any of the documents on their files unless you get the proper order from a court. Your children are illegitimate and so under Article 176 of the Family Code, you have sole parental authority. Your sister-in-law does not have any legal ground to keep your son away from you. If she does not want to give your son back to you peacefully, you can file a petition for habeas corpus to regain custody. hi, about the three options i've mentioned last April 08, 2009 1:33PM, if i would choose the 2nd option which is to be acknowledged by his father under RA 9255 but the appearance of the birth certificate remains the same. It just adds the acknowledgement of his biological father; - will it cause a problem in the Canadian embassy? Another is if I chose option 1, which is to to have its late registration in NSO in which my son’s name could easily follow his father’s surname; - this will cause confusion? which of the 1st and 2nd option is more advisable? or if there's any, please advice. Thank you. It is not a simple matter of your husband acknowledging the child as his own. You will have to undergo adoption proceedings under RA 8552. Please read my post “Procedures in adoption under RA 8552: (look for the link in the sidebar. If you and your husband simply obtain a birth certificate naming you and him as the parents, you will be charged criminally for “simulation of birth.” Also, if you immigrate later on, you will have problems since a lot of embassies require DNA testing. Despite the costs and the hassles involved therefore, you should go through the adoption proceedings. hope for your immediate reply. thank you. if his father will acknowledge my son under ra9255, does the embassy will still require DNA testing? hello sir... thanks for the info abt the adoption.ill check the link thanks. More power to ur blog. There are lawyers, individuals and companies which specialize in immigration to Canada. They are in a much better position to answer your questions. Hi good day. I already have 2 kids and the eldest is 6 yrs old, we are having problem on his enrollment for grade 1 because I want him to use his father's surname to be registered in that particular school. we were advised to get RA 9255 Form No. 1 rule 7.2.1 or an Affidavit to use the surname of the father but the thing is there is no entry on the father' s information on my child's birth certificate due to my husband's absence when I gave birth and same thing happened to my second child. We wanted to fix their documents, can you please help us with this matter cause we really do not know what to know. We really appreciate if you can teach us how. By the way Sir, We are not married yet and my children are currently using my lastname. hi atty. thank you so much for your help in advance. 1. Latest Certified Copy of Birth Certificate of the Child. Include dorsal page if signed by father. 2. Valid ID of Father and Mother (Original and Xerox Copy). CEDULA of Father. 3. Original and Photocopy of Baptismal Certificate. 4. Original school Records showing the names of the parents. 6. If mother is deceased, submit Certified Copy of Death Certificate (Latest Copy). 9. For interview together with both parents. The IRR list of documents is clear; the Manila LCR is asking for documents that are not listed in the IRR. The question is, are you willing to go through the hassle of fighting the LCR? We now have a law called “Anti-Red Tape Act of 2007.” The law will become fully effective by next year (one year after publication of its IRR). Senator Ping Lacson is the principal author of this law. Perhaps you can contact Sen. Lacson and ask for his help. Under RA 9255, your children’s father can issue an AUSF (Affidavit To Use the Surname of the Father). After you obtain this AUSF, then you can file it with the LCR. First of all I'd like to tell you how grateful I am for finding your website and just loved reading all posts. Anyway,I'd like to seek for your opinion/advice about my situation. I have a son who just turned 7yrs old this month. My child is illegitimate. And he's currently using my maiden name as his surname and blank for middle name. His biological father however signed the back portion of his b.cert (back then i was very innocent about the law thinking that I wont be able to register his b.cert if the father did not sign the acknowledgment portion, that's why I just asked his father just for the sake of signing and not for anything else) Anyway, for the past 5years, my son lived with me. And also his father and I never lived together. He was never really interested with our child at first and just visit once in a while. Until one day his great grandma came back from the US and found out about our child and she just became very interested about him. And since they're no different and I had a good relationship with his grandma, so I let them borrow my child like have him stay with them for some days, christmas and special occasions with no hesitations for as much as possible I would like to have a good relationship with them for the sake of my child. October of 2006, my dad's petition for me as an immigrant to United States has been approved. They sent my visa right away and was given the chance to migrate to US before March 19,2007... but sad to say cant bring my child yet with me yet. Mar.03,2007, few weeks before the said expiration date of my visa when I left the Philippines and had no choice but to leave my son for the meantime. I've decided to let him stay with his biological father since the granma beg me to have him stay with them for the reason that she's old already and wants to be with her grandchild. And so I let him stay with them since we have a good relationship. By the way, I am already married now and have 2kids with my husband. I got married here in US. To cut the story, I went back home just this march of 2009 with my family to visit my family and my child. I asked my mom and brother to pick him up so when I get off the airport I will see him right away. To my surprise, they didnt want give him to my family anymore. And when I went there to pick him up, his biological father and the rest of his family that I cannot take him with me or my child cannot go with me as I dont have the custody anymore since I moved to US and got married. That I only have sole custody only if I'm in the philippines, but since I left the country and got married, then automatically the custody will be on his biological father??? thats what they're claiming. That they have court order from a judge that I couldnt get near to my child since he has the full custody already but didnt show any proof of court order. How could that be possible for him to get a full custody? I never abandoned my child and going to United States of course for us thinking about our future. Getting married is not even an issue right for that is my personal prerogative as Im single and would not change the fact that Im still his mother. And i heard that they're working on changing his surname to his father's. I know that he'd still be illegitimate but is that possible to change without my permission? I want to know what are my rights as his mother? Before I left the phils. i actually made an affidavit giving authorization to my mother as the legal guardian of my child on my behalf. What will I do if he'd come down to my house and would forcefully get my child and will claim that he has the custody since im not in the country. Please tell me whats the best thing to do and how could I fight for my rights so I can advise my family too so they can be prepared. I'll be waiting for your reply and I thank you for taking the time in reading my post and more power to you. 1. As I discussed in this post, the child is illegitimate even if his biological father was able to change his surname on the basis of the IRR of RA 9255. As I discussed, the IRR of RA 9255 has become a tool for oppressing women like you, having taken away your choice as to whether your child will carry the father’s surname or not. 2. Please read carefully my post “Visitation rights over illegitimate children” (look for the link in the sidebar), especially the clarifications and related issues at the bottom portion of the post. The only rights the biological father has are visitation rights. Sole parental authority belongs to you as provided under Article 176 and as ruled by the Supreme Court in the case of Briones vs. Miguel. In the case of Silva vs. Court of Appeals (which I discussed in detail in this particular post, the Quezon City granted visitation rights to the biological father. But this did not prevent the mother, in the exercise of her parental authority, to immigrate to Holland with her two children. 3. What you should do is to immediately retain the services of a lawyer. Your lawyer can file a petition for Protection Order under RA 9262 so that you can regain custody of your child. If it is true that your husband was able to get a court order of some sort, your lawyer can file the necessary petition to have that order voided. Please read my posts on RA 9262 especially on Protection Orders (look for the links in the sidebar). thank you so much for responding to my reply.. i really appreciate on how you take your time in reading our concerns and give advices right away. Again thank you so much. 1. You do not really know whether there is such a court order that the man was able to get. That is why I told you to retain the services of a lawyer. Your lawyer can find out if there is really such a court order. If there is, then your lawyer can take the necessary and appropriate steps to have that court order voided. 2. Under Article 176, sole parental authority belongs to you since the child is illegitimate. Parental authority is governed by Articles 209 to 233 of the Family Code of the Philippines. Suspension or termination of parental authority is covered by Articles 228 to 232. Primarily, your parental authority will end when you die or when the child reaches 18. Please read these portions of the FC. 3. As I mentioned, in the Silva case, despite the grant of visitation rights to the father, the mother of the illegitimate children was able to take her children to Holland in the exercise of her parental authority. In simpler terms, this means that the biological father cannot interfere in the mother’s plans. The biological father cannot say that the immigration of the child with the mother is a violation of his visitation rights. Please surf to the DSWD website as to the amended and relaxed requirements for travel clearance for illegitimate children. I just wanted to let you know how grateful and thankful I am for giving me answers point by point to all of my queries. You've been a great help to me and to everybody. Again, I thank you for you advise and I really appreciate everything. Bless your heart always. may problema po kasi ako hindi ko po alam kung anung dapat kong gawin.gusto ko pong papalitan yung surname ng dalawang anak ko.ang nakalagay po kasi sa birthcertificate nila yung surname ng tatay nila pero po 1year old pa lang ang anak kong bunso naghiwalay na po kami dahil sa matinding dahilan pero po hindi po kami kasal pero nakalagay po dun sa birthcertificate ng mga bata kasal kami ngaun po 6years old na ang bunso ko at 8years old naman po ang panganay ko simula ng naghiwalay kami hindi na sya nagpakita pa until now at wala na po akong balita sa kanya wala rin naman akong hahabulin sa kanya kasi ngaun po ay 3years married na po ako.nagaaral na po ang mga anak ko pero surname ko ang gamit nila gusto ko na pong maging maayos ang birthcertificate nila ano po ang gagawin ko at sa paraang hindi ako gagastos ng malaki.tulungan nyo po ako.maraming marami salamat po! Some steps you can take are to avail of Rule 108 (correction of entries) or even adoption (if your husband wants to adopt your children). The problem however is if you take legal steps to have your children's surnames changed or go through adoption, you can possibly be charged for falsifying entries in a public document. gusto ko po malaman kung ano po mangya2ri kapag na charged po ako ng falsifying entries in a public documents?ano po ang unang hakbang na dapat kong gawin o saan po ako dapat magsimula para maayos ang lahat?maraming maraming salamat po sa pag sagot sa aking mga tanong! My sister had a daughter out of wedlock who is now 2 years and 1 month old. And the child is bearing her father's surname the father have signed the back of the birth certificate in order to admit his paternity..
How could we change the surname of my nieces into our surname? They are not together anymore,my sister had to leave (a month after she gave birth) because she is working abroad.i and my mom are the ones responsible for taking care of the child while she is away.the last visit of the father was May 4,2007 and after that he did not communicate with us nor give any support for his child..all the needs of the child were all provided by my sister..and now my sister decided to change her child's surname. what are the process we are going to make in order for this legal matter to pursue? In case we apply a passport for the child,do we still need the consent of the father? I am 32 years old and I have a 13 year old illegitimate son with a previous relationship. My problem is the father since we separated eight years ago do not give regular financial support to my child, worst, he doesn't even care to go on a regular visits. Another is he will be having another child which will be legitimate since they will be marrying before the womangives birth. he keeps telling me is not generating income). I know that support should also be aligned with the fathers capacity. But I suspect is that because he is preparing for the birth of his child, and thus all his income should be concentrated with the coming baby. Because he keeps on telling me that I have a work and that should be already be enough to provide for my sons needs. What is the proper thing to do, so just in case, he has regular work again, my son will not be deprive of any financial support from his father? I have a stable job, but parang sinasabi nya kasi sa akin na since kaya ko naman magprovide ok naman na kahit hindi sya magbigay. Kahit sobra pa ang capacity ko to provide for my son, excuse ba iyon para hindi sya magsustento? tatay nya dahil mas ok raw kung doon siya nakatira, my son is telling me na ginugulo nila yung utak ng anak ko. When we were still together we used to live at his parents house because we were both young then, yung mga parents nya rin ang nagprovide sa amin, and when we are both working already his parents took care of our child. Kaya sinasabi nila sa akin na they have more rights than me. Na kukunin nila ang custody ng bata sa akin. Can they do this? What if ang gusto ko is pwede nya lang dalawin yung anak ko hindi pwedeng papuntahin sa bahay nila? or kung gusto makita ng parents nya ipasyal lang nila sa mall? Mali ba ito? have this as reason not to give regular support). He will be working abroad anytime soon again this year, so I might be facing the same situation. I'm planning to work abroad and eventually get my son to live with me once I am established. But i cannot push through with this plan, so many opportunities have passed already. If I have appointed my sister as the guardian, can they just get my child in our house and claim custody since I am not around? illegitimate yung anak ko kaya the legitimate ones have more rights. I know for sure that legitimates have more rights than those who are not. son kung hanggang saan nagextend ang rights nya, baka kasi maghabol ako wala naman pala akong mapala of course ayoko lang magmukhang kahiya hiya yung anak ko. 5. I saw from your other blogs about AUSF, i dont know because eventually the father might know about this. So I may be force to have our son used his surname. But I just want to have an assurance, if ever this happens, I don't need to get a consent from the father when the time comes that I will be immigrating to another country with my child. And it will not in any way affect our immigration plans, kasi the birth certificate that were submitted in the embassy used to carry my surname. I hope you can answer my questions, as you did with the rest. Its been very informative reading your site. 1. Please read my post titled “Support for abandoned woman and family” as to the way you can ask for support. You already know that the court will balance between the needs of the person asking for support and the financial capabilities of the person from whom support is being asked. Considering however the problems you are having with your son’s father, asking for support is not such a good idea. 2. The issue of support and visitation are two different things. Please read my post “Visitation rights over illegitimate children” (look for the link in the sidebar). Since you and the father cannot agree on the times and conditions of the visitation, the remedy is to ask the court to settle your differences. Your child is illegitimate and so under Article 176 of the FC, you have SOLE parental authority over your child. “An illegitimate child is under the sole parental authority of the mother. In the exercise of that authority, she is entitled to keep the child in her company. The Court will not deprive her of custody, absent any imperative cause showing her unfitness to exercise such authority and care.”Even if RA 9255 is availed of and your child begins using his father’s surname, your son will still be illegitimate and you will still have sole parental authority. As I discussed in the post "Visitation rights ...", in the Silva case, the trial court granted visitation rights to the biological father. Despite this grant of visitation rights, the mother in the exercise of her parental authority was able to immigrate with her children to Holland. If ever the father or his parents take your son away from you, you can file a petition for Protection Order under RA 9262 to regain custody. If your husband or his family harasses you, you can also file a petition for Protection Order (it’s called a “stay away” order where the court will prohibit the father or any person acting in his behalf from coming near you, your son or any designated family member). Please read my RA 9262 posts (look for the links in the sidebar). I have already discussed in this post and my replies to the comments the matters you are inquiring about. Please read this post again especially the paragraph titled “Can RA 9255 be undone?” and “RA 9255 and its IRR as a tool of oppression against women?” The last section enumerates what legal actions can possibly be taken to have the child carry the mother's maiden surname. You should retain the services of a lawyer who can help you file the necessary petition for the change in your children’s surnames. As I said, there are potential problems since you can be charged criminally for falsifying some entries in the birth certificates. Firstly, your website is brilliant. Unfortunately I chanced upon it too late. I was researching about these issues before giving birth but I wasn't able to find anything as coherent as your website. Thank you for that. I studiously read each comment to see if anyone else shares the inquiry I have but so far I don't think I've read anything that asks the same thing. I gave birth last December 2007 to a baby boy. I was 20 and unmarried. My son shares my middle name and surname (I was completely ignorant of the 'leave-the-middle-name-blank' thing) although the father has signed the birth certificate and the acknowledgment of paternity. Question one: are there repercussions for not leaving the middle name blank for illegitimate children? We are planning to get married after finishing college and getting financially stable, probably after turning 25. Legitimization will happen by then, if I am correct. I decided that my son will have my surname until I get married, which complies with RA9255's use of "may". However, the IRR states that once the father signs the birth certificate -even if the child's surname was written as mine- it is mandatory that he will use his father's name anyway, is that right? Or does he have to submit as AUSF first? With legitimation, does the illegitimate child bearing the surname of the mother automatically get the father's name? Or does changing the surname of the child after marriage require another process (something similar to the AUSF)? 1. With the way the birth certificate appears now, you and your son are siblings, and not mother and son. One possible problem is if you immigrate. The nature of your relationship (whether as siblings or as mother and son) might cause problems in the immigration requirements. Illegitimate children shall use the surname and shall be under the parental authority of their mother, and shall be entitled to support in conformity with this Code. However, illegitimate children may use surname of their father if their filiation has been expressly recognized by the father through the record of birth appearing in the civil register, or when an admission in a public document or private handwritten instrument is made by the father.As you can see, the biological father’s signature is sufficient authority for RA 9255 to be applied. The “public document” referred to is the AUSF. Hospital personnel in charge of the birth certificates who know Article 176 as amended by RA 9255 therefore usually and immediately use the biological father’s surname once they see the acknowledgment. 3. AUSF Including all supporting documentsIt thus appears that the signed birth certificate AND the AUSF must be submitted to the LCR. The LCRs from town to town , or city to city however may vary in their interpretation and practice with the NSO guidelines. 3. Legitimation is governed by Articles 177 to 182 of the Family Code. Please surf to my website www.familymatters.org.ph for these provisions. 1. The original family name of the child as appearing in Registrar of Births shall not be erased or deleted, but in the remarks space shall be written "Legitimated by Subsequent Marriage" indicating the family name which the child shall bear by virtue of the legitimation also giving reference to the entry number in the Registrar of Legal Instruments. 2. When the interested party requests a copy of the birth certificate of a legitimated child a certified copy of the certificate of Live Birth bearing the annotation "Legitimated by Subsequent Marriage on ________ (date of marriage) at __________ (place of marriage)" or a certified transcription using standard form from the Register of Births bearing the effects of legitimation and the same annotation indicated in the certified true copy shall be issued. (Rule 66, A.O. No. 1 S. 1993)What requirements for legitimation must be submitted according to the NSO guidelines? (8) the manner by which the child was acknowledged by the parents which may be in the child's record of birth, in a will, a statement before a court of record, or in any authentic writing (not required for illegitimate children born or after 3 August 1988).HOWEVER, I have been informed by several people that some local government units are adding their own numerous documentary requirements for legitimation (like Statement of Assets and Liabilities, Philhealth, TIN, ITR, affidavit of support, etc) besides the documents already required by the NSO. These people who have e-mailed me have just about given up trying to comply with all the documentary requirements. They are also questioning the need for SAL, ITR, etc) and all this red tape. Don’t worry. Before the end of this year, the IRR of our “Anti-Red Tape Act of 2007” will become effective. Senator Ping Lacson is the principal author of this law. Under this law, red tape will be minimized, flowcharts as to what the procedures and requirements are will be posted prominently in government offices. Plus the names of the government employees who are in charge of certain functions will be posted with the flowcharts. Even during lunch breaks, a public assistance desk must be open. Required number of signatures for documents or transactions is limited to five signatories. If an application is denied, the name of the official who rejected the application must be revealed so that possible proper action can be taken. Moreover, if there are problems in the implementation of this law, the head of that government office can be charged administratively by the affected party. I visited your blog and found out that you are an artist. Please visit my "Campus Connection" blog www.campusconnection.blogspot.com where I have 40 lessons (and a lot of corny jokes) on photography. I took the pictures in my blog when I was a journalism teacher and yearbook adviser, 1989-1996. I love black and white photography; too bad, there are no longer any darkrooms, or Atlas developer and acid fixer, or Agfa Brovira and Portriga photopaper. My Canon AE-1 Program camera with Vivitar 28-210 mm zoom lens is in my drawer; I cannot find 6 volt batteries except in R. Hidalgo. Please also visit my related blog "A picture is worth a thousand words..." at www.words-and-photographs.blogspot.com. good day to you!!! I have a 7yr old illegitimate child. I just migrated here in USA with the help of my dad 3yrs ago and then eventually got married here and have my own family. Since, I cant bring my illegitimate child here yet and the petition for him is still pending to live here. I grant my mother through a notarized document that I am assigning her to be my child's legal guardian on my behalf. I know that he's biological father has visitation rights, but can they actually take away my child from my mother and would claim that they have the rights since he is the father therefore automatically he'll have custody since Im out of the country? What will I do if they did that? Can they really have that rights of having an automatic custody of my illegitimate child since Im out of the country? Pls help. I need your advice about this. Under article 176 of the Family Code, illegitimate children are under the SOLE parental authority of the mother. Even if your child carries his biological father’s surname under RA 9255, he remains illegitimate and under your sole parental authority. The father still only has visitation rights and not custody which is a function of parental authority. 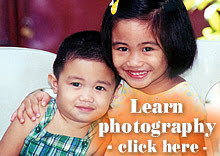 Parental authority is covered by Articles 209 to 233 of the family Code (please surf to my website www.familymatters.org.ph). If ever the father takes custody away from you or from your mother, you and/or your mother can file a petition for Protection Order under RA 9262 to regain custody of your child. Please read my RA 9262 posts (look for the links in the sidebar). Sir, I am not married yet with the father of my child so the last name that my child is using mine. We are planning to get married next year, can my child use the last name of his father? how? I mean is there going to be a long process? Your child can use the surname of the father under RA 9255; inquire from the Local Civil Registrar of your town or city as to the required documents. Since you are getting married (and assuming there are no legal impediments or obstacles like minority, etc), your child can avail of LEGITIMATION after your marriage. This means that upon applying and complying with all the requirements, your child as a LEGTIMATE child can use the father’s surname. Please read my post on legitimation; look for the link in the sidebar or use the search box at the top of this page. Again, inquire from the LCR as to the requirements. Since you are getting married, do not use option number  or RA 9255 because it applies to ILLEGITIMATE children. Use option number  or legitimation. Atty, thank you for your immediate reply. I want to ask another question. The father of my child is in oman and we only communicate there through internet and cellphone. When the birth certificate of mychild is done, he wasnt able to sign it because there is no way that i can send it to him. Next year, he will come back here in the Philippines for our marriage. Can my child use the surname of his father after that? Please inquire with the Local Civil Registrar as to what documents (besides the signed birth certificate) are required to be submitted in order for RA 9255 to be used. After all the requirements have been complied with, the LCR will annotate the birth certificate with the family name that the child will be using. Like I said however, RA 9255 is for illegitimate children. Since you are getting married,do notmuse RA 9255. Instead, use the FC provisions on legitimation. 1. pwede bang gamitin ng anak ko ang apelyido ko even if im married? 2. pwede bang kasuhan ng wife ko ang ex ko even if wala kaming relasyon at hindi kami nagsasama kong gagamitin ang fmily name ko sa anak namin? 3.if ever maregister sa kanya ang familyname na ank namin temp. anong legal procedure ang dapt gawin pag ililipat cya sa apelyido ko? YOU can be charged with psychological violence under RA 9262 for your marital infidelity. The penalty is six years minimum. Your ex gf can be charged in a civil case for damages. Please read my post “Adultery, concubinage and psychological violence” (look for the link in the sidebar). good day attorney! gusto ko lang po sanang magtanong kung pwede po akong mag file ng financial support for my son though illegitimate ang anak ko dahil pinakasal ang father ng anak ko ng parents nya mula nang nanganak ako, and hindi ko pinalagyan ng name of father ang birthcertificate ng anak ko as in N/A ang nakalagay. do i need to prepare a document or letter of acknowledgement to be signed by the father of my son kahit na kinikilala naman nya ang anak ko verbally? mag 5 years old na po ang anak ko ang never akong nanghingi at never syang nag alok ng support for the reason na inintindi ko ang side nya for the longest time. nangako po sya na susuportahan nya ang anak ko pero i doubt dahil ngayon pa lang na tumatanggap na sya ng allowance sa pagtraining as police wala syang binibigay na support para sa anak ko. please also advice kung san po ako pwedeng kumuha ang free legal service ng lawyer na nagspecialize ng ganitong case. Please read my Legal Updates post “Support for abandoned woman and family” or download my free PDF newsletter Issue no. 004 July 31, 2008 "Financial support for abandoned woman and her children"
Essentially, through a Protection Order, the court will order the man and his employer (the PNP for example) to set aside a certain percentage of his salary to be remitted directly to you and your child on a monthly basis. If the man and/or his employer fail to do so, they can be charged with contempt of court. The amount of support is balanced between the necessities of the person asking for support and the financial capability of the person from whom support is being asked. Since the man did not sign the birth certificate or any document which states that he is the father, you will have to file a petition for compulsory recognition of your child. This petition can be filed together with the request for a Protection Order for financial support. Hi Atty...just wanna seek legal thoughts or advise from you...I have 13 year old daughter, she is handling my surname kasi ....meron na po siyang aunthenticated birth ceritficate but her dad's name is "unknown"...May passport na din po siya.But would like my daughter to take his father's surname this time for her future benefit.What would I do so that she can legally use her da's surname?Remeber , she has already an aunthenticated birth certificate under my surname.But gusto akong i petition ng fiance ko. Could I still bring my daughter with me eventhough she has different surname?Pls share with me your knowledge regarding this matter. Thanks a lot. You will encounter difficulties in immigrating with this kind of a situation. Embassies and consulates are requiring the consent of the other parent for the child to immigrate (regardless of whether the child is legitimate or illegitimate). Even with an authenticated birth certificate, embassies or consulates might require you to provide an affidavit of consent from the biological father. Please take note that even if your child can use the surname of her biological father, she will still be illegitimate. Moreover, if and when your fiancé (later on your husband) decide to adopt your daughter, there might be problems if her surname is that of her biological father. the father in law of my niece borrowed the 2 kids but since then failed to return them up to now. The family of the guy claimed that they don't know the whereabouts of the 2 kids for the father got the 2 children on the night of dec. 08, 2008 We know it is just an alibi since the the guy has a new live in partner and resulted to a new child . The children of my niece have used the surname of their father but since they are married therefore her children are still illegitimate. My question is who has the right for the custody of her 2 children? The guy parents keep the children and they are just telling that the 2 children are with their father even though it is not true. please do advise . we them to show up the 2 children they have kidnapped them since dec' 08, 2008. Your niece or anyone acting on her behalf can file a petition for Protection Order under RA 9262 in order to regain custody of the kids. The petition can be filed against the father and his family. i have a 4 year old daughter, and she is using her biological father's surname which he also acknowledged her..we got separated when my daughter was only 5 mos old.he is giving support but not that constant until my daughter turned 1 was the last support that he has given 1500 for the birhtday and gave it to my mom.now i have a partner and planning to adopt my daughter.its been 3 years now and i havent heard from the biological father..what will i do regarding this matter?can i file a correction and cancellation in the civil registrar?or there still another due process before this..thanks..im looking forward for your reply..
As you have read in this post, the use of the father’s surname is for the benefit of the illegitimate child. Changing the surname from the father’s surname to your name is not that simple. What you and your partner (the law requires that you must be married) can do is to adopt the child. Please read my post “Procedures in adoption under RA 8552” (look for the link in the sidebar. hello att'y Ive read some of the post here and I would like to ask about my case.Im already here in the u.s and Im planning to petition my parents back home in the philippines but I later found out na my nso birthcertificate have a wrong entry. the detail is my parent are never married but they put on my birthcertificate that they we're married and has a date on it.so my question is what will I do to fix my birthcertificate? and what is the procedure? at forget to mention Im using my dad surname and my parent are still together just never get married. To correct the birth certificate, you have to file a petition for correction or cancellation of entries in your birth certificate under Rule 108. The problem is that your parents could possibly be charged for falsifying an entry in your birth certificate. Since you are in the US, you can authorize someone to file this case for you. If you need a lawyer to handle this petition for you, please e-mail me so I can refer a lawyer to you. Even if your parents are not married, under RA 9255, you have the right to use your biological father’s surname. 1) What will be the implication since my daughters remain illegimate as per their birth certificates, but in fact I was married to their father then eventually annulled (in the event that it finally is)? 2) If ever I got married again after my marriage had been annulled, can my future husband adopt my daughters from my previous marriage? 3) You mentioned in your previous post that I will have problems in the future in going abroad if I'll be bringing them with me as we will be using different surnames when my marriage is finally annulled. What do you suggest the best thing to do? Do I have to legitimize my daughters? Is it alright if I choose not to have them legitimized anymore? 4) Do we have a law right now that makes changing of names/surnames possible? If I had to battle with it in courts,I would. Kindly enlighten me, Atty. Thank you in advance. The Family Code provides that legitimation of the children takes place after the man and woman are validly married. This means that legally speaking, even if the documents for legitimation have not yet been filed, the children can be treated as being legitimate when it comes to their share of the inheritance. In a petition for declaration of nullity, the division of the properties of the husband and wife, and the giving of the presumptive legitimes (share in the inheritance) are included in the decision of the court. Illegitimate children are entitled to one half of whatever a legitimate child gets. Since the documents for the legitimation of the children have not yet been filed, the share of your children as to their presumptive legitimes are that of illegitimate children. However, it can be argued that their share should be that of legitimate children. Please read my post “Procedures in adoption under RA 8552”. The law provides that the biological father must give his consent to the adoption. As to whether you should file for your children’s legitimation, that is a personal choice for you. You should consult a lawyer in person (not just through posting like this) so that you can fully know the implications of whatever your choice will be. RA 9048 or the Guinigundo Law allows the changing of names when it comes to clerical errors or in first names actually used. For substantial errors like gender, birthdays, paternity, RA 9048 does not apply. The proper procedure is Rule 108 of the Rules of Court. You and your husband should adopt your daughter. Please read my post “Procedures in adoption under RA 8552” (look for the link in the sidebar). The biological father's consent is necessary unless you can prove that despite earnest and diligent efforts you can no longer locate his whereabouts. Please e-mail me so I can recommend a lawyer who can handle the adoption for you. thanks for the response and more power!!! Please read my post titled “What happens in an annulment case if the respondent fails to file an Answer?” (look for the link in the sidebar). What your wife is asking you to do (that is, to sign a waiver) is known as “collusion” and will lead to the DISMISSAL of her petition for annulment. Your wife is totally misinformed about what she is asking you to sign. hi atty...i'm working on s private school...i just wanna ask if what is the ruling regarding change of surname?...our graduate student came here in our school and asking us to change her surname...what are we going to do? Please consult the Legal Department of the DepEd or the CHED for guidance. You should ask that student to provide your school a court decision which allowed the change in her surname. In case she availed of RA 9048 (Guinigundo Law) or of RA 9255 (change of surname for illegitimate children) with the Local Civil Registrar, you should also ask her to submit a notarized affidavit regarding this change in surname. If the student does not have such a court decision or a notarized affidavit as to her change in surname, your school can validly refuse to make such change. first of all, thank you for the very informative blog. we deeply appreciate your legal comments & opinion. may i forward to you the case of a woman who is married, and has a son by another man (the biological father). the woman would like to adopt the surname of the biological father for the son. since she is married to her husband, wouldn't this be impossible under our laws? can we consider the child illegitimate? in most cases, the "illegitimate child" is the child of a woman who is not married. would deeply appreciate your comments, and more power to you sir! The woman is married but has a son by another man. This a complicated issue legally as to the status of the child. “Children conceived or born during the marriage of the parents are legitimate.” Since the child (even if the father is a man other than the husband) was born during the marriage, the child is presumed legitimate. Finally, please read carefully the 2005 Supreme Court decision in the case of “Gerardo Concepcion vs. Court of Appeals and Ma. Theresa Almonte.” In this case, Gerardo filed a case for declaration of nullity of his marriage to Theresa on the ground their marriage was bigamous. Theresa was already married to a certain Mario when they got married (and Mario was still alive and living in Quezon City.) As a result, the trial court declared their son Jose Gerardo to be an illegitimate child. When the trial court denied Theresa’s motion to have Jose Gerardo’s surname changed to her maiden surname, she brought the case up to the Court of Appeals. During the period that Gerardo and Ma. Theresa were living together in Fairview, Quezon City, Mario was living in Loyola Heights which is also in Quezon City. Fairview and Loyola Heights are only a scant four kilometers apart. Not only did both Ma. Theresa and Mario reside in the same city but also that no evidence at all was presented to disprove personal access between them. Considering these circumstances, the separation between Ma. Theresa and her lawful husband, Mario, was certainly not such as to make it physically impossible for them to engage in the marital act. Sexual union between spouses is assumed. Evidence sufficient to defeat the assumption should be presented by him who asserts the contrary. There is no such evidence here. Thus, the presumption of legitimacy in favor of Jose Gerardo, as the issue of the marriage between Ma. Theresa and Mario, stands. As you can see, the woman is in a legal mess. Since the child is presumed to be the product of the marriage (despite actually being the child of another man), the woman's husband should file a petition within one year of the birth of the child questioning his paternity of the child. tanong ko lang po kung pwede ba akong mag file ng financial support para sa anak ko kahit surname ko ang nakalagay sa birth crt. nya....tnx! Please read my post titled “Support for abandoned woman and family” (look for the link in the sidebar). You have to file a petition for COMPULSORY RECOGNITION of your child against the biological father and at the same time ask for issuance of a Protection Order for financial support. Through DNA testing and/or other means provided by Article175 in connection with Article 172 of the Family Code, you will have to establish that indeed the man is the father of your child. Once that has been established, you can ask the court to compel him to support your child. RA 9255 is the law allowing illegitimate children to use the surname of the biological father. On the other hand, since you are getting married to the father of your illegitimate child, then LEGITIMATION under Articles 177 to 182 of the Family Code might apply. This assumes that at the time your child was conceived and born, there was no legal impediment or obstacle o your marriage. Whether RA 9255 or legitimation under the Family Code, you can inquire from the Local Civil Registrar in your town or city as to the requirements. THANK YOU SO MUCH ATTORNEY...More powers to your site. I am a 26 year old single parent. The father of my daughter and I were only 19 and unmarried when I had her. My parents kept us away from each other since our daughter was born (although we were allowed to meet occasionally) and he never provided regularly although sometimes he would give presents. So I took care of my daughter solo, with my parents' financial aid. I broke up with him more than 2 years ago. I didn't like the idea that I was already the one taking care of my daughter solo during the day, working during the night and spending for my daughter solo and on top of that he had the guts to ask money from me since he was and is still jobless. From time to time, he would make contact but I'm the one avoiding him. But to this day I am still unmarried. My problem is that on my daughter's birth certificate, he signed acknowledging that he is the father. But my daughter is using my surname and my middle name as well. (My parents and I didn't know any better. We have no legal knowledge regarding this matter). I am afraid that one day his father will come back and take her away from me. What is the best thing that I can do with regards to my daughter's name? Do I have some sort of protection or assurance that my daughter will not be taken away from me? I really need advise from a Christian lawyer. The child is illegitimate and so under Article 176, sole parental authority (which includes custody) belongs to you. Even if an illegitimate child is using the father’s surname under RA 9255, the child will still be illegitimate. What the biological father has is visitation right. Please read my post “Visitation rights over illegitimate children” (look for the link in the sidebar). If you and your child will be physically or psychologically threatened in some way by the man, then you can file a petition for a Protection Order (”stay away order”) under RA 9262. Please look for the RA 9262 links in the sidebar. As you have already read in this post, there are problems with the Implementing Rules and Regulations of RA 9255. You can file a petition under Rule 108 to correct the birth certificate of your child (to remove your middle name from the child’s name in the birth certificate). However, since the man signed the birth certificate, under the IRR of RA 9255, his surname will automatically be used in the birth certificate. This is why I said that the IRR of RA 9255 have become a tool for oppressing women. i need your help. i will be giving birth soon. i am carrying a child of a married man. we've been together for years now and we just cant get married because we are still working on getting financially stable and earn money to file for annulment on his previous marriage. our problem now is that should we and in what part of the birth certificate we may indicate the name of his father(the married man). does putting his name anywhere on our baby's birth certificate cause any problem? if it will, what should I write on the name of the father space? should his name not be visible in any part of the certificate? i am still hoping somehow we can still put it as a record that he is the father and so the baby may not be so much different with regards to her records. hoping for your quick response before i give birth.. again thank you so much for your help. We are okay of using my surname for now. we just don't know what part of the certificate can we indicate his name. If we may.. If the father signs the birth certificate, that can be used by the legal wife to file an RA 9262 or concubinage case under the Revised Penal Code against him. The birth certificate contains an acknowledgment of paternity which the father can sign. you mean he can sign the "acknowledgment of paternity" part considering this situation? if in case he can't sign anywhere to avoid legal cases against him, can i just put his name on the father's name field? The hospital staff or the LCR will not allow you to place in the birth certificate the name of a man as the father unless there is proof that you are married. In acknowledging the paternity of an illegitimate child, the biological father can sign the birth certificate, OR instead issue a public or private document. The father of your child has these options. Like I said, however, such can be used against him by the legal wife for example in an RA 9262 case against him. I can only provide you with the legal information relevant to your situation. You have to make the decisions yourself on what to do and you have to bear the consequences of such decisions. pano po kung parang wala ng pakialam ung father sa anak nya. ano po pwedeng gawain? My child is using her father's surname, and the father has also signed both the back of the BC and an affidavit for the child to use the father's surname. However the address on the affidavit was mistyped by the clerk, using my address instead of the father's. Should I have it corrected, or does the wrong address NOT matter. If I should have it corrected, what steps should I undertake? The wrong address is NOT material (or important) as to the issue of who the father is or who the parents are. You can of course if you want to, have it corrected under RA 9048 by applying with the Local Civil Registrar of the birth place or of your current residence. In terms of support, you can compel the father to support your child. Please read my post titled “Support for abandoned woman and family” (look for the link in the sidebar). In terms of emotions, there is nothing you can do legally to force the father to exhibit affection or love towards the child. Duly noted Atty. Thank you so much for your time! im a late registered illegitimate child. my father was deceased nd i used my mother's last name and have no entry for my middle initial. it is BLANK..
accrding to your blogs, this is correct. but it seems to me that nobody knew that this is right. im applying for abroad and im worrying that i will have to deal with lots of mess regarding my name or worst the employers wont hire me..can you tell me what to show them or what ill have to do? do you have the full article that proves that MIDDLE INITIAL cud be left blank?? please help.. lots of thanx.. Godbless.. Applying these laws, an illegitimate child whose filiation is not recognized by the father bears only a given name and his mother’ surname, and does not have a middle name. The name of the unrecognized illegitimate child therefore identifies him as such. It is only when the illegitimate child is legitimated by the subsequent marriage of his parents or acknowledged by the father in a public document or private handwritten instrument that he bears both his mother’s surname as his middle name and his father’s surname as his surname, reflecting his status as a legitimated child or an acknowledged child. You can go to the Supreme Court in Padre Faura St. Manila, either its Public Information office or the library. You can ask for a certified true copy of this Supreme Court decision. If and when you are questioned by embassies or consulates, you can provide them with this Supreme Court decision. Hi, while searching for an AUSF form, i stumbled upon your blog, and was pleased to see how you interact with the readers. 4. my daughter's mother leaved my daughter to stay with me, my wife and my parents during her 2-5 years of age. 5. my daughter then stayed with me and my wife during her 5-6 years of age. 6. my wife managed to have my daughter's mother to visit our daughter 2-3 times a week. 7. during one (1) rainy day while my daughter is visiting her mother's place (accompanied by my wife) she left my daughter with the company of her mother in favor of the rain which was pouring hard that night. 8. after the rain, when i come to fetch my daughter, that's when she decided not to give my daughter back, she even boasted to pay all the expenses me, my wife and my family made, I even reasoned out to get my daughter at the end of the school year, since my daughter is already attending Kinder 1 classes, but looks like she made up her mind already. 10. my daughter has been with her grandmother ever since, I've also heard that of the 2-3 years that passed, the mother have only visited my daughter once. 11. my father's dying wish was to see my daughter, but the mother declined the wish, my father died without seeing my daughter for the last time. 1. can this be a sign of abandonment? 2. can I have sole custody of my daughter? 3. is there still hope for me, my wife and my family to see or better to have my daughter returned to me and my family? i gave birth to a child not my present husband but from another man whom i had a one-night affair. i had the child's surname under my husbands but he isnt aware of it but knows about the child. i havent filed the child birth certificate at NSO office and only had it registered in the local municipal ofc. my question is can i still change the child's surname and put it under my name? and how will i go about it? thank you. Your daughter is illegitimate and so under Article 176 of the Family Code, sole parental authority (which includes custody) belongs to the mother. All that you have is visitation right. If you and the mother cannot agree on the terms and conditions of the visitation, then you will have to file a petition in court asking it to set such terms and conditions. Please read my post “Visitation rights over illegitimate children” (look for the link in the sidebar). I was researching about AUSF when I came across your blog. The reason why I was reading about this RA 9255 is that I want to know whether my husband who is a child born out of wedlock can use the surname of his father. I've been reading this RA 9255 thing but I can't get the explanation if a situation is like this - the recognizing father is already dead and no proofs of relationship whatsoever can be shown between his parents like love letters, except for some support during the education of my husband. My husband really wanted to use the surname of his father. The problem is the recognizing father is already dead so it is impossible to secure his consent or admission. Can my husband(the son) file the AUSF? As I understand the law, AUSF can be filed by the father, mother, child or guardian. Kindly advise what happens next after filing. I mean what further steps follow after the filing if my husband can validly file the said public document. Thanks for your advice in advance. More power. 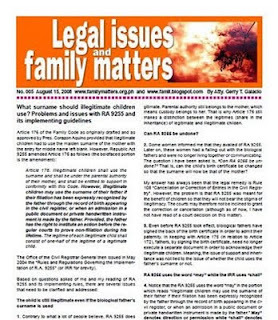 We have to distinguish between RA 9255 on the use of the father's surname AND the Family Code provisions on how a person can establish his/her illegitimate filiation. (2) Any other means allowed by the Rules of Court and special laws. The “admission in a public document” refers to the AUSF, while “private handwritten instrument” refers to letters, documents, etc in which the father admits that he is the father. The AUSF is signed by the father himself and is notarized. If the father is dead, then of course he cannot sign the affidavit. There would not be any AUSF to speak of. By “filing” you might be referring to the act of physically going to the LCR and submitting the AUSF. If this is what you mean by “filing”, then of course, the father, mother, child or guardian can file the AUSF. Please take note however that they themselves cannot sign the AUSF; it is only the father who can sign the AUSF. But since he is already dead, that is a problem. Since you also cannot find any "private handwritten instrument" where the father admitted his paternity of your husband, this is also a problem. Atty Gelacio, thank you for your time for explaining briefly the related provisions in the law to answer my question. More power. I worked in Saudi Arabia in 1994-1996 but got pregnant in the middle of those years to an Arab guy...but since i am not married to the father of my daughter ( its against to their Islam Law to have a child out of wedlock), just to get out from Saudi and bring my daughter with me, some friends help me to secure a fake marriage certificate with a filipino guy (that we were married in Saudi Arabia) just to register my daughter and be able to file a Birth Certificate using the SURNAME of this fellow filipino guy and the Phil. Embassy in Jeddah issued a Birth Certificate back then. Since its hard for me to travel to Saudia Embassy , a year after our return to Phil...i registered my daughter in my surname at the local registrar and put N/A on the Father information..and for the past year i was using the NSO Late Registration Birth Certificate of my daughter for any related school records, etc. But recently i am processing a Tourist Visa to USA ( we were invited by my American BF to have spend holidays) , ask a new Birth Certificate at NSO, only to find out that my daughter Birth Certificate is now the one registered in Saudi Arabia and according to NSO, it was locked to that since it was the first one filed and the late registration birth certificate is now disregarded. Please advise me what to do in correcting the Birth Certificate of my daughter so i can bring her to USA and future adoption. Will there be a problem in applying for a legal documents(e.g. passport, visa) for my child because he is also carrying my middle name? I found this Clause.."Since the man refuses to acknowledge the child, then the surname of the child will be that of the woman with the ENTRY FOR MIDDLE NAME LEFT BLANK...."
I am a single mom of a two year old boy, hasn't been married to the father of my child, he never showed up again since i was 3 months pregnant up to now. Obviously, no support at all. Will there be a problem in applying for a legal documents(e.g. passport, visa) for my child because he is also carrying my middle name? This is because I am planning to migrate abroad. Thanks you very much. Since you and your child are using your middle name, your relationship is that of sister and brother, not mother and child. This will present a lot of problems in your documents. You should file a petition to have your child’s name changed under Rule 103. Hello..i've been trying to find some answers to my questions and i was relieved that i came to this page..
i have a friend. she's not married but she's with her partner right now. they have two sons. in the birth certificate, the sons were registered using the mother's surname. however, when they started to study in elementary, they're using the father's surname. the problem now is that the mother wants to apply for a passport for the sons..will be the application for passport easier? the parents are both in abroad but the children are in the philippines with the grandmother..
i have a 4year old son who is using his father's surname. we are not married. for the past 3 years, no support from him. he stalked us, harrassed my friends. is there a way to have my son's surname changed to my surname? how will that affect my son? i still want to keep the acknowlegdmnt of paternity, but i wanted to have my son use my surname. i proposed this to my ex. but he seems to not like the idea. for reasons i dont know. looking forward to hearing your advice. What do you mean by “easier”? If your friend wants to have the birth certificates show the father’s surname, all she has to do is go to the Local Civil Registrar of the town or city which issued the birth certificates. She can ask there what the documentary requirements for RA 9255 are. 1. As I discussed in this post, you can try filing a petition to nullify the IRR of RA 9255. If you are successful in having our courts nullify the IRR, you can then file a petition to have your child’s name changed to that of yours under Rule 103. 2. RA 9255 was intended to erase the stigma of illegitimacy. Your son may suffer from embarrassment and ridicule from people if they know that he is illegitimate. As to the surname that a married woman should use, please read my post on this topic (Please look for the link in the sidebar). This is an issue which only the US embassy can answer. Please consult persons or companies who specialize in immigration issues. Goodday! Im glad that through searching a free legal council by net i have found your blog. (01) Can it be possible to use the father's surname as my baby's surname; and my surname as my baby's middle name? (02) Will my baby still consider as illegitimate after using the father's surname. (03) Is ther any cut off date or how long will it be possible to file for my baby's birth certificate. Actually the father will be coming after 3 months na ipinanganak ko ang bata. (04) What are the requirements required for filing my baby's birth certificate. Kasi po ang sabi sa hospital kelangan mauna ang baptismal cert. dahil late reqgistration na daw po ang pagpi-file ng birth certificate. (05) Sino sino po ba ang kelangang tao para maayos ang birth cert ng bata. Sana po ay matugunan nyo ang mga tanong ko. Malaking tulong po ito sa akin. Maraming salamat po at merong free legal council na gaya nito sa internet. I will not send my reply to the e-mail address you indicated since I do not have any assurance that it is yours. Yes, it is possible under RA 9255. But the child will still be illegitimate even if the father’s surname is used in the birth certificate. The father has to issue what is known as an AUSF (Affidavit to Use the Surname of the Father). Please go to the Local Civil Registrar of the town or city where the child was born and inquire as to the requirements for RA 9255. May inquiry lang po ako about sa kaso ng aking malayong pamangkin na ang ginagamit na apelyido ay sa ama niya (Evangelista) pero nang kinuha ko ang birth certificate nya ay nalaman kong wala pala siyang apelyido ni pangalan. ang nakasulat lamang ay apelyido ng ina (Reyes). Ang ina po nya ay no read no write po kaya wala nakalagay na anumang impormasyon sa birth certificate maliban sa apelyido ng ina at address ng kanilang tirahan. ang malala po rito ay hayskul na po ang bata at ang apelyido ng ama ang ginamit nito sa eskwelahan. Ikalawang pamilya lamang po sila ng kanyang ama. although may communication sila ng kanyang ama mukhang malabo naman na i-acknowledge ito at gawing benipisyaryo. Ano po ba ang magandang gawin? Paano maitatama ang kanyang birth certificate? mahirap po lamang sila at walang kakahayahan na kumuha ng abogado para sa kasong ito. Sana po ay matulungan nyo po sila. Your relative can try to apply for late registration with the Local Civil Registrar of the town or city where the child was born. If late registration is not allowed, your relative can file a petition for correction of the birth certificate through Rule 108. You can also try asking for free legal help from the Integrated Bar of the Philippines (IBP) chapter offices in your town or city. The IBP chapter offices are usually located in the Hall of Justice. Besides the IBP, you can also try to ask for help from the OLA (Office of Legal Aid) of the UP College of Law in Diliman, Quezon City. The San Beda College of Law in Mendiola, Manila also has a free legal clinic. I would like to ask some legal advice regarding my child. He's now 8 years old but he did not used my family name. What would be the remedy in order that my child can use my family(surname). Right now He's using the family name of His mother. I have an acknowledgment at the back of the birth certificate of the child. please give me some legal advice. I already replied to your e-mail. I am grateful to find your site. Thank you so much. I hope you can enlighten me more re: late registration. My friends' husband has a 17 year old kid that she only found out a week before their wedding. they got wed. Now the kid is illegitimate i assumed. Now as per my friend, the kid was born in 1992 and her birth certificate shows that his supposed father - my friends' husband did not signed the birth certificate issued by the hospital. it was the brother of the mother. Then, when the kid is about to go to college, they were asked to do a late registration where in the father signed at the certificate. My question is, is the kid stays illegitimate? what are her rights? Can she carry his surname? what are the basic rules and docs needed for late registration so just my friend will know if this is void or valid in case there requirements that were not submitted by his husband. Many thanks and god bless you. Why are you the one asking these questions and not your friend? As I discussed in this post, Article 176 as amended by RA 9255 allows an illegitimate child to use the surname of the biological father. But the use of the father’s surname will NOT make the child legitimate. As to the requirements, please inquire with the Local Civil Registrar in your town or city; you can also surf to the NSO website. I have recently gotten married and my husband wants my child who is now 4 years old to use his surname. He wants to adopt my child as his own. Can i ask what steps should we make in order to do that? And what gvernment agency should we go to? Thank you so much in advance. A Blessed Christmas and a Prosperous New Year to you and your family. I will assume that your husband is a Filipino citizen. Please read my post "Procedures in RA 8552 domestic adoption and RA 8043 inter-country adoption; misinterpretation of RA 9523" (look for the link in the sidebar). By adopting your son, your husband obtains parental authority over your son, and your son acquires the right to use your husband's surname. Please take note however that your relationship with your son is illegitimate. To make your relationship with your child LEGITIMATE, you will also have to adopt him (in the same petition to be filed by your husband). Do NOT follow what other people may advise you and your husband, that is to get or apply for a birth certificate identifying your husband as the biological father. This is a criminal offense known as "simulation of birth". I discussed also in the post on adoption the problem of whether consent of the biological father should be obtained. 1. Will there be a chance for an illegitimate child to be legitimate once his real father and real mother (who is not married) if they file an adoption for him/her to be a legitimate? 2. What if his/her real father who is married already but not to her real mother can file an adoption to make him/her a legitimate child, will these suffice to make him/her an legitimate child? 3. What are the rights of the legal wife? if there is no mutual understanding or agreement and the step mother does not want him/her to be adopted? Will the father can still file for adoption to make her/him legitimate? 3. or we'll she/he remains illegitimate if the step mother will not file for an adoption? 4. what are the rights of an illegitimate child? Your question number 1 is a little bit confusing. If the biological father and mother get married, the child can become legitimate through what is called LEGITIMATION under Articles 177 to 182 of the Family Code. But there must be no legal impediments or obstacles at the time the child was conceived and born (for example, minority or being below 18 on the part of the father or mother). Do you mean to say the UNMARRIED biological father and mother will BOTH adopt the child? I have not come across this situation before and I don’t know of any Supreme Court decision on this matter. Please take note however that a person who has been adopted cannot be adopted again. Also, if they are both unmarried, they should get married and just avail of legitimation as I discussed above. The reason why the biological mother (whether married or not) by herself adopts her own illegitimate child is to raise the child’s status to that of a legitimate. The unmarried biological father can adopt his illegitimate child also for the same reason, that is, to make the child legitimate. What about the situation where the biological father is married? Section 7 of RA 8552 (Domestic Adoption Act of 1998) requires that the married biological father must obtain the permission or the consent of his legal wife for the adoption. If the legal wife says no, then the petition for adoption cannot be filed. Article 176 of the Family Code enumerates the rights of illegitimate children. Please read my primer on illegitimate children (look for the link in the sidebar). Thank you so much for your very interesting reply. It was very helpful. God bless you. The reason why the biological mother (whether married or not) by herself adopts her own illegitimate child is to raise the child’s status to that of a legitimate. - we assume, that the child will be legitimate when the biological mother who is not married nor had no previous marriage can adopt her own child to be legitimate? Once approved, does the child will also have the same rights as a legitimate child to his biological father who did not adopt him? or just with the one who adopted him? if the child is 18 years of age, is it still possible for his mother to file for adoption? Thank you so much atty. Happy new year. "Once approved, does the child will also have the same rights as a legitimate child to his biological father who did not adopt him? or just with the one who adopted him?" Answer: The child remains to be an ILLEGITIMATE child of the father. The child becomes the legitimate child only of the person who filed the petition for adoption (in your example, the mother). "if the child is 18 years of age, is it still possible for his mother to file for adoption?" Generally, only those below 18 can be adopted. Exceptions under Section 8 of RA 8552 are paragraph c (adoption by the biological mother or father) and paragraph d (a person of legal age, if, prior to the adoption, said person has been consistently considered and treated by the adopter(s) as his/her own child since minority. if you and your husband got married recently but you and your husband got a child out of wedlock is there a way to change the child's surname to his biological father and can the child be still a legitimate??? hi! i have nephew who wants to use his father surname but the problem is the don't cooperate with the possible document might b needed specially in school records, but we the copy of birth certificate from NSO stating that the child will be known as his father surname. question is can do to make his mom cooperate with us. i am the aunt the father of the child is my brother. Yes, through LEGITIMATION under Articles 177 to 182 of the Family Code. Please inquire with the Local Civil Registrar of your town or city or the NSO if you qualify for legitimation. Basically, for legitimation to apply, the child must have been conceived at a time when the mother and the father did not have any legal impediment or obstacle (like being below 18, a validly subsisting marriage, etc). For example, if either the father or mother was married to another party at the time the child was conceived, then legitimation cannot take place. As I discussed in this post, your husband can go to the Local Civil Registrar and submit the requirements for RA 9255. However, as I also emphasized in this post, my view is that the mother’s consent for the change in the child’s surname is necessary. My boyfriend got other girl pregnant before we we live together. It was never an issue to us to let them use his surname before, but the girl's family was threatening him to file legal actions if he is not going to provide financial support after the baby got born. The girl has not yet file the birth certificate of the baby because she doen't want to use her last name because the baby will not have a middle name?Can they use his last name even without his signature to avoid legal problems? Because i have a friend who was able to use his father's surname even though it was not signed by his father, However, he was born at home in a province and he doesn't know how his mother file his birth certificate and we don't know if the procedure is the same in filing for birth certificate in Laguna and Manila. The other baby was born in a hospital in manila. Thank you in advance for your help. Even if the father does not sign the Acknowledgment of Paternity, he can allow the use of his name if he executes a public or a private handwritten instrument under RA 9255. Thank You So much for the answer Atty.How much do you think it will cost us to make the child legimate?? Hi, just want to ask how many years of imprisonment for the ra 9262 respondent? thanks. The professional fees of lawyers vary; in Metro Manila, the standard acceptance fee is fifty thousand pesos, with the legal costs and expenses (filing or docket fees, transcripts, service of summons, publication, etc) all for the account of the client. In the provinces, the professional fees of lawyers are lower. In dealing with lawyers, do not be shy or embarrassed in bargaining about their professional fees. What kind of RA 9262 case are you referring to - psychological violence? economic abuse? sexual abuse? physical abuse? Please read Section 6 of RA 9262 (look in the sidebar for the links to my RA 9262 posts). “Arresto mayor” is one month and one day to six months. “Prision correcional” is six months and one day to six years . “Prision mayor” is six years and one day to twelve years. I filed ra9262 against my husband back in 2004, just this month was the promulgation of judgement.. but i was sooo disppointed with the penalty.first, the supposed to be date of the promulgation was reset last minute.. siguro a day before the said date..according to others, if there;s a final date of promulgation, it should not be reset at all unless the judge is not available on that date.. but the reason which my atty gave me was the lawyer of the accused asked for a reset because of some seminar that the atty will attend..
next thing is.. i was disppointed with the result because it took 6 years to wait for the justice for me and my kids ... but sad to say, i cant feel there is justice because the conviction is only 6 mos plus 100k fine to the government.. accdg to them, there;s no moral damages because accdg to them it was not included in my prayers when the case was filed... but during that time, i dont really know the details of the law even the lawyers or prosecutors in the city hall were not aware of the new law.. so they dont know the details then.. they only read or scan the copy of the law very briefly and hurriedly helped me to file the ra 9262 case, so inshort all of us really dont know how to maximise the ra 9262 law that time since they dont have the copy of the law.. i was the one who gave a xerox copy to the prosecutor that time.. kaya very frustrating..
is it still possible to file a reconsideration or any motion for the moral damages just to add weight on the penalty to the accused??? kasi i really feel the result was so unfair.. to think i was the one who undergone counselling etc.. because of the depression, spend lots of money every hearing because its too far from my place..it took me 3 years to recover from that depression while my eldest son 5mos to recover from the trauma and now after i heard the result, i think the court even made it worst.. i cant stop crying because of the hardships me and my kids experienced with my batterer husband.. tapos yun lang ang parusa..? plus the accused was not imprisoned because of the "probation" thingy..
is it true that the accused will be imprisoned after 15 days after the promulgation of judgement day? so that the accused have the time to apply for probation??? what is that atty? how long would that be? pls help me how to add weight on the penalty for the accused.. (since just this morning yung promulgation of judgement) baka may pwede pa magawa bago matapos ang 15 days..kindly suggest what i can do or file just to make it somewhat fair for me and my kids..
by the way.. just a week before the promulgation,ive confirmed that mny husband has 2 kids(3yrs old is the eldest) with his live in partner now.. (my kids are 6 and 5 yrs old).. but i think he didnt allow the kids to use his surname.. i am not also sure that he used his real name on the birth certificates of his 2kids with his live in partner because my husband used to use different names even when we are still together, he used a different first and last name to the owner of the apartment, because i was shocked to found out that the landlady was looking for a different guy, i told the landlady that i dont know any person with that name but when she saw my husband, she said that "oh there you are" and when i asked my husband whats the purpose, he just said that its better to be safe... thats all..
my question is.. is it possible for him to put a different name on the birth certificate of his 2 new kids? if he allow to use his real name, is it possible to use the birth certificates as an evidence for filing concubinage? or its not advisable at all to file concubinage because i might spend so much money again just to be frustrated with the result again? pls help atty.. i dont know where and whom to ask for some honest to goodness answers.. thanks so much and hope to hear from you soon.. God bless.. I have not read any of the documents related to your case, especially the court’s decision. You should ask your lawyer to explain all these things to you and what your remedies are. If the judge’s computation of the penalty is wrong, then your lawyer can file a motion for partial reconsideration so that the proper penalty can be applied. Like I said, I do not know how your case proceeded. But the normal procedure is that in a criminal case, the civil aspect (damages) is impliedly instituted. This means that unless you ask for the separation of the civil aspect from the criminal case, then the issues of civil damages will have to be taken up by the court. Your lawyer should have called you to the witness stand and ask you to quantify in terms of money your sufferings (physical, psychological, etc), and what your actual costs (attorney’s fees, etc) have been. What you can do is get a copy of the court’s decision and show it to other lawyers who can study it (together with the other records). They can then counsel you on what to do. You can try asking for free legal help from the Integrated Bar of the Philippines (IBP) chapter offices in your town or city. The IBP chapter offices are usually located in the Hall of Justice. Besides the IBP, you can also try to ask for help from the OLA (Office of Legal Aid) of the UP College of Law in Diliman, Quezon City. The San Beda College of Law in Mendiola, Manila also has a free legal clinic. Your husband can, of course, either file a motion for reconsideration or file an appeal with a higher court. Instead of appeal, he can apply for probation since the penalty is less than six years, assuming he has no previous conviction. If you have proof that your lawyer did not fulfill her duties to you, you can file against her an administrative case for suspension or disbarment with the Commission on Bar Discipline of the Integrated Bar of the Philippines (IBP Building, Julia Vargas Avenue, at the back of SM Megamall, near Metrobank). Hi, I have a 4 year old son, I gave birth last April 18, 2005. His father is a British Citizen. I never have him registered until now because his original Birth Certificate was witth his father. He was in London when I gave birth and told me to send him the BC for the Paternal Acknowledgment since we're not married. I still got his text message confirming that he received the docs together with the pictures of the baby and informed me to send it back asap. Unfortunately, I have lost contact with him. Two months later, his x-wife called informing me that the father of my baby is no longer coming back to the Philippines because he is in jail and will be in jail for 5-10 years. From that moment on, I've heard nothing at all anymore. What I am planning now is that, I want to late register my son under his father's surname without his acknowledgment. Will it be possible? Or how can you help or advise me about the situation of his father. Thank you so much.. I will be looking forward for your advise. The Local Civil Registrar most probably will not allow the registration of your son under the biological father’s surname without his acknowledgment. Try to ask the British embassy here in the Philippines for help in locating your child’s father. Don’t believe at once what the ex-wife said about the man being in prison. i have a 5year old son,on his birth certificate he's using his father's surname.it is because his father acknowledged him and signed on his birth certificate. i am a single mom,his father and i are no longer communicating for almost 5years now. i'm the one who is sole raising my son now,and this year i'm planning to send him to school.can he use my surname and not his father's because i am the one who worked hard to feed my son and to give him all that he needs?can i change his surname to mine even without going to the NSO and have it processed or changed? please help me.. i really want my son to use my surname because his father is irresponsible,he never helped me since we broke up after i gave birth to our son. and i think his father is not deserving to have his surname used by my son.. i'm really confused. please reply on this.. thank u so much and God bless! I am married for 3 years, pero naghiwalay kami ng husband ko dahil nambabae sya. i dont need his support for our son and ayaw nya asikasuhin annulment namin. wala naman akong time mag-ayos. my question is, can i have my daughter surname changed (my surname) kahit hindi pa kami annuled ng husband ko? THANK YOU! Good day po. i just wanna ask po about sa BIRTHCERTIFICATE procedure.. birthcertificate ko po kc sa NSO, LERICO GATDULA PANCERAS but then, since birth po, im using JERICHHOPE GATDULA DONCERAS in all my credentials.. applicable po ba sken yung RA9048? at me isa p apong problema, nung tym po kcng pna register nila ako, hinde pa po sila kasal ng mother ko, it was 1985.. anu po kya legal procedure na pde ko gawin.. tnx po.. GODBLESS..
Good day Atty. Galacio. I have a 3yr old daughter. Her father and I are planning to get married in a few months time. My daughter is using her Dad's surname since her father was able to sign in her certificate of live birth.As her parents, we want her illegitimate status to be legitimize. Her father was still married at the time I conceived my daughter. Her father is a Filipino citizen who is now a permanent resident in Canada. He is now recently divorced and his citizenship is Filipino at the time the divorce was granted. He was advised by his divorce lawyer in Canada that once his petition for divorce has been granted, he can remarry. We are planning to get married abroad since I have been advised that we cannot get married here in the Philippines since his first marriage has not yet been annulled. 1. If we get married abroad, will that marriage be valid here in the Philippines? 2. Let's say if that marriage is valid in the Philippines, how can we have our child's illegitimate status be legitimize? 3. If legitimation of our daughter is not possible through the required procedure that applies to that of stated in Article 177 of the Family code, is there any other way to legitimize our daughter's status? Your expert advice is highly appreciated Sir. Thank you very much! And God bless! If we get married abroad, will that marriage be valid here in the Philippines? Since the man filed for and will get his divorce when he is still a Filipino citizen, his divorce will NOT be recognized here. Please read my post “Divorce obtained abroad by a Filipino not recognized here” (look for the link in the sidebar; please read the comments and my replies to the comments). Thus, your marriage even if celebrated abroad will not be recognized here also. If legitimation of our daughter is not possible through the required procedure that applies to that of stated in Article 177 of the Family code, is there any other way to legitimize our daughter's status? You said that “her father was still married at the time I conceived my daughter”. This impediment totally disqualifies your child from being legitimated under Articles 177 to 182 of the Family Code. If you by yourself adopt your child through RA 8552 (please read my post on adoption; look for the link in the sidebar), your relationship with her will become legitimate. Can the man adopt your child? Since his divorce will not be recognized here in the Philippines as I discussed above, he cannot marry you and therefore he cannot join you in the petition for adoption. RA 8552 provides that spouses must adopt jointly. He can however by himself adopt your illegitimate daughter but he will need the consent of his legal wife and/or children. RA 9048 applies only to clerical errors/minor errors and to change of first name. The problem is with your surname. Rule 108 cancellation or correction of entries in the civil registry may be the more appropriate remedy. If there were no problems with your name, then you can possibly apply for LEGITIMATION under Articles 177 to 182 of the Family Code. But since there are problems in your birth certificate, you might be forced to file a petition under Rule 108. You need to retain the services of a lawyer to file this petition for you. As I discussed in this post and as you can read from the comments and my replies to the comments, it will be very difficult if not impossible for you to have your child’s surname changed. I'm a single mom and I would just like to ask if i can give my "middle name-last name" as surname for my baby? Since your baby is illegitimate, his/her surname will be your surname. The entry for middle name in the birth certificate should be left blank. You cannot use your middle name as the baby's middle name since it will appear that you are siblings. Thus, you cannot also use your "middle name-last name" as the surname for your baby. I am a single mom. My son's going to be one year old soon. He took his biological father's surname with my consent.I decided to use his surname for the child because he promised to make things work out between the two of us. But recently we have been arguing about the baby's rights.He has his issues of not doing is obligation as a father due to his personal interests which I could do nothing about. And this issue has disturbed me a lot lately that I wanted to change my baby's surname to my surname. 2. how long or hassle will the process be? and how much could i possibly spend for everything? more than 5 yrs na po akong hiwalay sa asawa ko nagkaroon po ako ng bf at nabuntis po ako mag isang taon po cya. ang gnagamit nya pong surname ay ung surname ko nung pagkadalaga. ndi po kz pumayag ung nkabuntis sakin na ipagamnit ung surname nya kz po complicated msyado. ask ko lng po if ok na po ang lahat pede po bng mapalitan ang surname ng anak ko ng surname ng father nya? thanks you very much atty. godbless po..
You will find it very difficult if not impossible to have your child’s surname changed to that of yours. This is because RA 9255 was meant for the benefit of the child, that is, in erasing the stigma of illegitimacy. “Erasing the stigma of illegitimacy” does not mean that the child becomes legitimate once RA 9255 is applied. What is erased is the “stigma” (in the vernacular, “kahihiyan”) and not the fact of illegitimacy itself. You are in a legal mess. Please read my post “If a wife gets pregnant by a man not her husband, will the child be legitimate or illegitimate?” (look for the link in the sidebar; please read also the comments and my replies to the comments). Since you are still legally married, it is presumed that your husband is the father of the child. If you use the name of the biological father in the birth certificate of the child, this can be used as evidence against you in a criminal complaint for adultery. I am a single mom of a 4 years old ,, she is using my family name,and the fathers name to her birth cert is NA. because her father doesnt know that i got pregnant.. meaning to say tinago ko sa father nya..
im hoping for your answer. I already discussed in this post the answer to your question. You and the father of your child should go to the Local Civil Registrar and submit the requirements under RA 9255. I am 16 yrs old,..When I was born hindi pa kasal yong parents ko but still I am using my father's name. Ang problema lang po kasi eh UNKNOWN ang nakalagay na pangalan ng father ko. What are the legal procedures should I take para malagyan ng pangalan ang father ko sa bc ko ngayong kasal na sila.? Please read my post “Legitimation, the rights of illegitimate children, Spongebob and Gary, Dingdong and Marianne ...” (look for the link in the sidebar). Legitimation is covered by Articles 177 to 182 of the Family Code, and takes place when the biological parents get married after the birth of the child. However the Family Code provides that when the child was conceived, there must be no legal impediments or obstacles. Meaning, at the time you were conceived, were your parents both above 18? Were your father and mother both single when you were conceived? If there are no legal impediments, then you can qualify for legitimation. Just go to the Local Civil Registrar of your birth place and ask for the requirements for legitimation. You can also use RA 9255 to be able to have your birth certificate marked that you are allowed to use your father’s surname. But RA 9255 is for illegitimate children. Like I said above, you might qualify for legitimation (for legitimate children).